The Beats Active Collection’s Powerbeats2 Wireless earphones give you the freedom to take your run or workout anywhere in style. The Active Collection’s Powerbeats2 Wireless earphones give you the freedom to take your run or workout anywhere in style. Inspired by LeBron James, Powerbeats2 Wireless is designed to defy the ordinary while catapulting athletes towards unparalleled performance. Lightweight and engineered with the power of dual-driver acoustics, the reimagined wireless earphones deliver the premium sound and performance needed to propel you through your run or workout. From the street to the court, Powerbeats2 Wireless gives you the freedom to take your workout anywhere. Wireless Bluetooth® gives you the ability to connect up to 30 feet to your Bluetooth-enabled device—allowing you to move freely and stay focused. A rechargeable battery with 6-hour playback gives you the power to endure to the end. If you’re on empty, a 15-minute quick charge delivers an extra hour of non-stop playback. Don’t let sweat stop you. Powerbeats2 Wireless is sweat and water-resistant, with over-molding on the RemoteTalk™ control for a no-slip grip when changing volume, switching tracks, and making hands-free calls. We designed it with you, the athlete and runner, in mind. 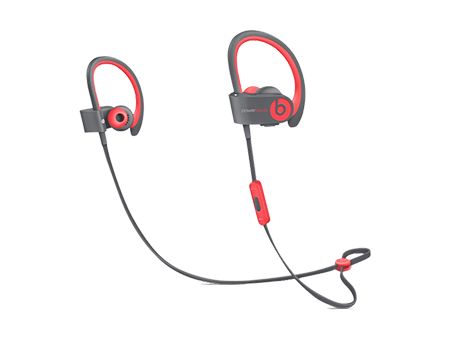 Powerbeats2 Wireless is lightweight and compact with adjustable earhooks providing a comfortable and secure fit. *Functionality may vary by device.